Sichimi Togarashi is seasoning for splinkling over the foods. But this is not such a supporting role, this is for eating per se as leading role. It isn’t too hot than I expected. The taste is like fresh green chili. It is very good with rice. So,I’m unsatisfied, but it will be able to substitute. 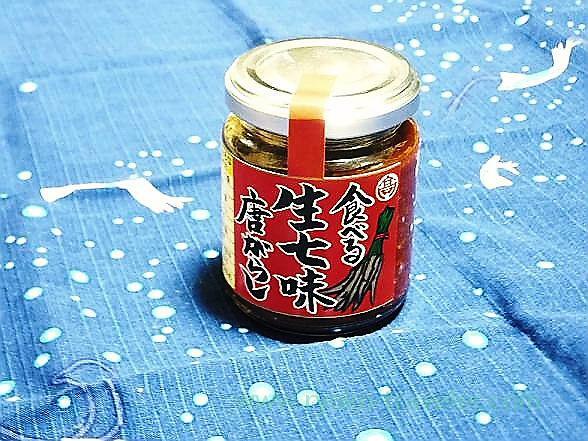 Maikohan no raayu is best chili oil (raayu) ever for me, but sorry, you can’t buy by this link from abroad…. If you have a chance to go to Kyoto (or Kansai airport), you can find it at many shops. I haven’t tried Maikohan Hii Hii raayu, but I love their super-spicy ichimi togarashi. I bought some when I was in Kyoto last year, and I’ll be very sad when my supply runs out! Taberu Nama-Shichimi Togarashi sounds yummy. I can buy Yagenbori at my neighborhood Japanese market here in California, but I always get some freshly-ground and extra-hot from their shop in Asakusa whenever I’m in Tokyo.